What strategies could we use to find out how many squares you shaded in? Can you come up with a set of rolls that would perfectly cover up the 100 squares? I prefer the variation where each player gets their own worksheet with a 10x10 grid. Players take turns rolling two dice. Once they roll, they must fill in a rectangle whose dimensions match the dice. So if you roll a 2 and a 5, you must shade in a 2x5 rectangle on your paper. Once you shade in your rectangle, you write the multiplication fact at the bottom of the page. Players alternate turns until someone rolls a set of numbers that they are unable to draw. That player is out, and play continues until all players are out. The player who shaded in the most squares out of 100 is the winner! How Close to 100? is a multiplication game, but what makes it better than the dozens of other multiplication games that you can find or buy for your iPhone? Unlike other multiplication-based games, How Close to 100 embeds a visual model of multiplication into the game, which makes it a great way to help kids who are still developing their understanding of multiplication. Your child may not remember off the top of their head what 4*6 is, but they can shade in four rows of six squares. While they do so, they can count by 4s, count by 6s, or even count each square individually. But over time and repeated practice, they'll get sick of those old, inefficient methods and begin trying to create more efficient strategies. Eventually, of course, the goal is to build true fluency with multiplication. But it's nice to have the scaffold of a rectangular array to help structure their thinking. And believe me, understanding the area model continues to be a deeply important math skill in middle school and beyond. Additionally, the end of the game provides a great chance to talk about addition and subtraction, as you try to figure out who won the game! I'll explain more below. When I played with my son, I didn't expect him to know his multiplication facts. I was interested in seeing how he thought about placing the rectangles strategically. He's not old enough to be expected to know multiplication. If he gets the idea of "four rows of six," I'm happy for him to count them by ones. So I mostly stuck with my old favorite question, "What do you hope to roll?" This question got him thinking about the sorts of rectangles he'd like to shade in, and what numbers he'd have to roll in order to get those rectangles. At the end of the game, you need to figure out who won! Ask your child "How many squares did you shade in?" Your child has two choices: First, she can add up all the areas of the rectangles to find the total squares she's shaded. This is a great chance to talk about multi-digit addition and finding friendly numbers (numbers that are easy to add such as 12 and 8). 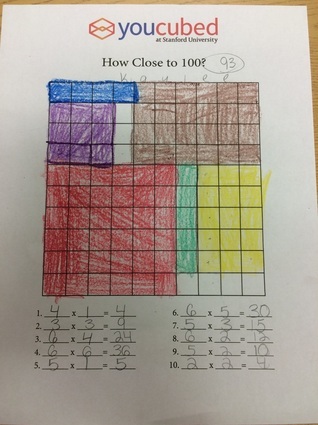 Alternately, she could count up the number of squares that are unshaded and subtract that amount from 100. Maybe you should use both methods! Use one method to check the other. If there's a discrepancy, try to find where you made your error. If your child can find and fix their own mistake, they are far more likely to learn from that experience. Lastly, I always like to look for ways to find a puzzle within the structure of a game. Ask your child "Can you come up with a set of rolls that will perfectly cover up the 100 squares?" If they find one, ask them to look for another! Maybe you could set a goal: eight rolls. They have to find a perfect way to fill in the entire board with just this eight rolls. Or maybe they have to find a set of rolls that fills the board, with no repeated rectangles! Is that even possible? Try to find out! These extensions are what bring the joy of How Close to 100? out in kids who are much older than the typical 3rd grader, as well as kids who are so young they don't even know the term "multiplication" yet. I highly recommend you print out a couple of copies of the worksheet and try this one out at home.